Many people are curious about Yin Yoga poses for insomnia. Yin Yoga is a practice of Hatha Yoga poses that emphasizes restorative and passive holds of traditional Yoga postures. Rather than strengthening postures such as Triangle Pose and Warrior Pose, Yin Yoga practices often focus on restorative backbends, hip openers and forward bends as a way to increase the level of flexibility in the connective tissues, ligaments and muscles. Deep, diaphragmatic breathing also complements Yin Yoga poses well because full Yogic breaths help to soothe an overactive nervous system and relieve stress and anxiety. There are many Yin Yoga asanas that will help combat insomnia. Yoga practitioners who experience difficulty falling sleeping, waking up too early or don’t feel refreshed when they awaken often have nervous systems that are operating on overdrive. This agitation leads to elevated levels of adrenalin and cortisol in the blood, which leads to an inability to fall asleep and/or to sleep deeply enough to feel restored upon awakening. Yin Yoga poses for insomnia, such as Child’s Pose and progressive relaxation in Shavasana, will help a Yoga practitioner to slow down, relax and release deeply held stress and tension. As a sense of well-being and relaxation is nurtured by the practice of Yin Yoga asanas, cortisol and adrenalin levels will begin to stabilize, allowing a Yogi or Yogini to fall asleep more easily and sleep more deeply. Practicing Child’s Pose in a supported fashion is very nurturing, calming and soothing. If you feel scattered, anxious, or unsupported, this is a great Yoga asana to practice in order to calm and nourish yourself in preparation for sleep. To practice Supported Child’s Pose you will need a Yoga bolster or a thick blanket or two to roll up to approximate the size and shape of a bolster. Place the Yoga bolster or blanket length-wise on your mat and come to your hands and knees straddling the bolster. 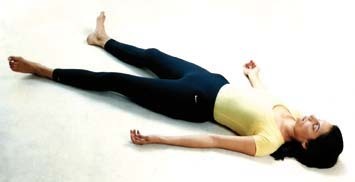 Lie down on the bolster so that it is supporting your entire torso, neck and head. Place your hands on either side of the bolster. Rest here for five to fifteen minutes changing the direction of your head periodically. Come up slowly out of the pose. You may wish to sit for a five minute meditation after practicing Supported Child’s Pose. Lie on your Yoga mat with your hands at your sides, palms facing up and your feet comfortably far apart. You may wish to place a Yoga bolster under your knees in order to release tension in the lower back. As you rest, move your awareness in a clock-wise fashion from toe to head around your body. You may wish to tense and then release each muscle group as part of a progressive relaxation exercise. Hold this posture for at least ten minutes to receive the full benefit of Shavasana. Many Yin Yoga asanas help us to combat insomnia. Thank you Kimaya Singh for writing this helpful article. As a sense of well-being and relaxation is nurtured by the practice of Yin Yoga asanas and allow a Yogi or Yogini to fall asleep more easily and sleep more deeply. Thank you Kimaya Singh for writing this useful article.